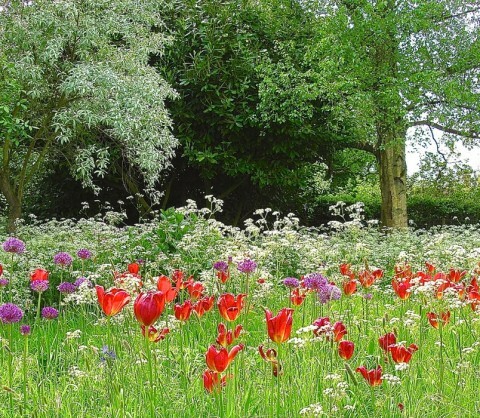 A large number of gardens in this pretty village south of Hitchin, Hertfordshire offer a variety of sizes, styles and planting with many interesting details including unusual plants, wild areas and water features. The small Arts and Crafts church of St. Martin will be beautifully decorated with flowers and will be open to visitors. Stalls on the Green and teas in the Village Hall. Barbeque on the Green from 12.00noon. Lunches can be booked at the famous Red Lion pub. We are sorry but dogs other than assistance dogs are not permitted in the gardens. All proceeds in aid of St. Martin's Church. £6.00 adutls, accompanied under 16s free. Buy tickets/map on the day from the entrance of the parking area or from the stall on the Green. The small village of Preston lies three miles south of the town of Hitchin.